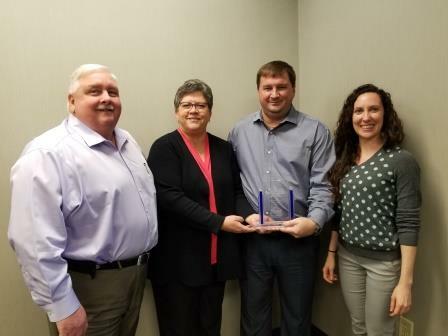 Fishman President and CEO Bob Wagner (left) celebrated the recognition with Fishman team members Mary Henritz (holding the award), Shane Richmond and Stephanie Moliterno. Fishman Flooring Solutions has been named Distributor of the Year for 2017 by the Floor Covering Distributor Alliance (FCDA) and the Alliance’s Powerhold™ brand of flooring and flooring installation products. The award, presented on January 29, 2018 at the FCDA annual meeting in Las Vegas, recognizes a distributor member of the FCDA for leadership in sales of Powerhold products and involvement with the organization’s board and its marketing initiatives. There are approximately 630 products sold under the Powerhold brand. Included are tools, such as tile cutters and seaming irons, as well as supplies ranging from adhesives to tack strips to sports flooring. Powerhold products are sold exclusively through the FCDA network of 19 distributors located in Australia, Canada, New Zealand and the United States. Baltimore, Maryland-based Fishman Flooring Solutions distributes more than 36,00 products to flooring installation contractors in Delaware, Georgia, Indiana, Kentucky, Maryland, New Jersey, North Carolina, Ohio, Pennsylvania, South Carolina, Tennessee, Virginia, West Virginia and the District of Columbia. Fishman Flooring Solutions is a founding member of FCDA.